March 6, 2019 Another apparent leak adds more fuel for the Octane fires. That comes via an anonymous source speaking to Daily Esports. The source also provided a higher quality version of a bit of Octane promo art that had hit Reddit earlier in the week – the same image you can see in the header above. Here’s the point where you’re going to be warned to take it with a grain of salt – especially since we’re so early in the life of Apex Legends that we don’t yet know where the reliable leaks are coming from. His listed passive is Swift Mend, which automatically restores health over time. His tactical is Adrenaline Junkie, which costs 10% health to give Octane eight seconds of boosted speed. And his ultimate is Launch Pad, which deploys an item that can launch you (and, presumably, other players) into the air. 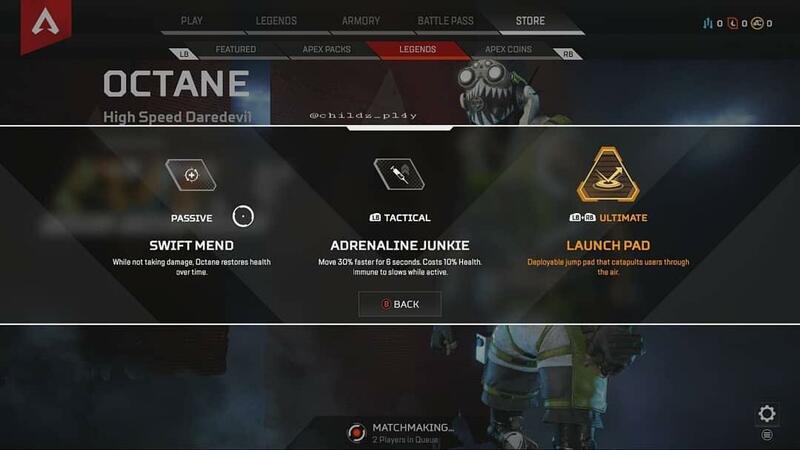 Octane’s apparent debut is on the Apex Legends subreddit with over 20,000 upvotes, though the image itself links is watermarked for ‘childz_pl4y’ – an Instagram account that’s since been set to private. A Reddit account pointing to that Instagram promised pictures and descriptions of Octane’s abilities nearly a week before. Notably, the image we’ve seen in the more recent report matches the bit of Octane we see in the background of that Reddit post. Whether that’s proper corroboration or just somebody making art based on an another ‘leak’ remains to be seen.